Alongside well-known patriots, such as Samuel Adams, Rev. Samuel Cooper, and Dr. Joseph Warren, there was another "voice" whose words and music became the protest songs of the American Revolution. William Billings, tanner, hogreeve, and musician, through his compositions, singing schools, and incendiary performances provided ways for the "mechanicks" of the lower classes, including women, to be equal participants in disseminating rebellion throughout colonial New England.In Singing Sedition, Charles E. Brewer provides a thick cultural interpretation of the significance of Billings's texts and music through the use of both published and unpublished manuscript materials. 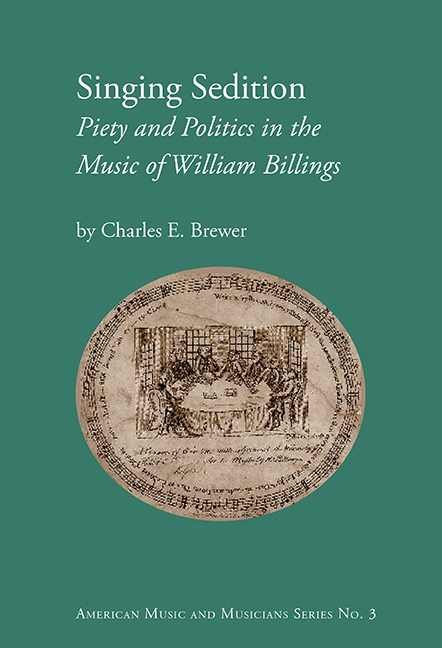 An examination of sermons preached in Boston, Biblical commentaries, letters, diaries, and other sources clarifies the New England political theology expressed through Billings's creative adaptations of biblical texts and their evocative musical settings. From the Boston Massacre to the peace of 1783, Billings's music can be heard as the soundtrack of the American Revolution.